After many hardships in her life, Chise Hatori ended up at an auction, where she was purchased and then freed by the renowned Thorn Sorcerer, Elias Ainsworth, only to stay and become his apprentice. Though her life is wonderful now, the arrival of a picture book, "The Lonely Little Star," brings back memories of those trying times and the loneliness she endured. As a child, Chise experienced a great tragedy: her mother's death. Shunned and unwanted by peers and relatives alike, she has lived a detached and pitiful life. However, the unexpected discovery of a mysterious library in the forest provides her with a temporary place of solace. Through reading countless books and spending time with the kindhearted librarian, Chise slowly begins to feel less alone in the world. But could this peculiar library have a darker side? 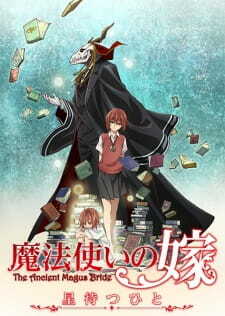 Mahoutsukai no Yome: Hoshi Matsu Hito is a prequel to the Mahoutsukai no Yome manga series. The Mahoutsukai no Yome’s a neat little side story. The main appeal of the ova is essentially seeing how everything is presented rather than the actual narrative elements themselves. The anime doesn’t try and get you interested in Chise by telling you she’s an orphan hated by everyone for being weird, it wants you to get invested in her through scenes like her not being able to go to bed because there is literally a monster inside her futon or her talking about how happy she feels when she finishes a book. The story never asks you to doubt that it’s all going to work out fine, it knows its viewer has either already read the source material or totally understands she’s in a better place because of the first part of episode 1, it uses that knowledge to frame a vignette used to contrast her younger self: who always used to sit in a corner, walk with her back slightly bent afraid to connect to people, to her current self: upright, smiling and scared into eating her food instead of avoiding it. The catharsis doesn’t come from what’s framed. But rather the feeling that is evoked when looking at it. Chise didn’t grow much as a person when she gave the book and moved away, she lost more hope than she started out with, but the moment it goes back to her reading the book on Ains’ lap, surrounded by people who care for her, there’s this very understated feeling of relief and ease. The fact that it goes from her not believing that it will all turn out alright to her having turned out fine in a few seconds doesn’t take away from the unease and anxiety that filled her childhood because it was a retrospective to begin with and only furthers the message it’s trying to convey. In the same way Chise treasures the book after having had her life changed, the viewer is supposed to treasure her change in lifestyle using the dark past as a basis and not as the main aspect to the OVA. What’s important isn’t what’s in the past, it’s what’s about to come. Another big appeal is definitely the sound and visuals. The way it dulls down the colors whenever it’s a scene in the apartment compared to how lush the greenery looks during the library scenes or the comfy and warm colors used when she’s living at Ains’ house convey a lot about how she feels like she is happier when at those places. It sparingly uses music, like for parts where the colors are enough to convey whatever needs to be conveyed, but for parts like some scenes where the librarian talks to her, the piano keys perfectly match whatever’s going on onscreen. Seeing Chise’s bright red hair contrast with the foliage is very pleasing to the eyes and makes the scenes where her hair color’s muddled with the background to help convey her anxiety much more meaningful. The biggest highlight is definitely the scene where the librarian reads her the story: weaving together the book’s moral with the star imagery and what she was going through with what she will one day find, supported by one of the few times the music uses multiple instruments rather than just a piano to elevate the scene into something memorable, it’s just such a powerful scene, lives up to being the reason why she’s telling this story in the present day about why the book means so much to her. Ultimately, it’s pretty much just a sneak peek for the upcoming tv anime, but it’s very reassuring to know that the adaptation will try its best to portray the wonders of magic of its world and the relationship between the two mains and the baggage they each carry. So The Ancient Magus' Bride is a show I'm eagerly waiting for when Fall 2017 finally decides to arrive. I have not touched the manga so I knew little about it, but the synopsis and the magical elements piqued my interest enough to check out this prequel OVA that took a year to finish airing 3 eps. After finishing it, I'm not exactly sure why this was necessary. The plot is simply a back story to the main girl Chise Hatori, seeing what her life was like as a child way before she found the world of magic. The drama shown during these episodes are pretty standard, we've all seen the same type of scenario before. You have the struggles of a strange and lonely orphan trying to find a place to call home, (The Ugly Duckling) and the forsaken love of a mysterious librarian. (similar to The Little Mermaid, and no not the happy Disney version) To be honest, this didn't do much to get me invested into the main series, as it felt kinda pointless to see the past of these characters that I have never met before I've actually gotten to know more about them. There is not given much reason to actually care about Chise, you’re just suddenly given a character that you're supposed to like and feel sorry for. This may have been enough for some people to care about her, say they have read the source and/or are able to relate to her as a character, but I personally feel that I needed to see more from Chise before I could actually see her as someone I should harbour feelings towards. Maybe if I had read the manga I would have enjoyed it more, but as someone that's never watched or read anything else from the series, I'm just left with a lacklustre taste in my mouth. I'd recommend watching this after the main series is finished airing or at least reading a decent amount of the manga, it might have been more impactful if I had actually gotten to know who these people are before delving into their previous lives. As something to start off an anime adaptation, I enjoyed the experience but I'm not too impressed with this OVA. Send feedback if you have any, thanks for taking the time to read my thoughts on this! It was a beautiful story although it only lasted for three episodes. Keep in mind that there's a full length series coming this October. I've never read the manga and I don't intend to read until the I've finished watching the upcoming anime series. So, in this review, I'll only be talking about what I think only from watching the OVA. The story was beautiful. If you haven't read the manga, you'll be kinda confused at first but not that much. As far as I see, the OVA mainly focus on Chise's backstory. And I have to say, it was very good. From the first episode, it might seem like it's very slow paced but the main story kicks in starting from the second episode. And the pacing and the story matches very well. And at the of the 3rd episode, I might make some people teary. There's nothing really I can say about it except it was amazing. The characters look good and sceneries are breadth taking. But I can't help but feel that they could have done a little better considering this was made by the same studio which took part in production of Attack on Titan anime. The sound tracks did't stood out that much but I have to say, it matches the story and setting very well. And he sound track did make the anime more beautiful. The characters are pretty awesome. You won't see any of the character archetypes that you often see in other animes. But each characters were charming in their own way. What can I really say apart from that it was really awesome. I waited for 1 and a half years for these 3 episodes and I'd say it was worth the wait. It was everything I hoped it to be and even more. Overall, this is a kind of anime that you won't really find that often. And it's still just an OVA and there'll be a full length anime series coming October. It might take the anime fandom by a storm or it might become a hidden Ruby among the anime fandom. These 3 episodes were conducted really well and makes me hyped for the upcoming series.